Some of my best granola recipes have come from failed granola bars. More often than not I make a granola bar and it falls apart instantly thus becoming granola. Either that or it turns into an inedible, granola brick. This is probably because my kitchen does not have many of the chemicals that sneak into supermarket granola giving them that perfect texture (and a shelf life from now until the end of time). These are so chewy and flavorful and easy… I almost couldn’t believe it. The recipe originally called for dried cherries (I went for their cheaper cousin dried cranberries). The recipe also called for a chocolate drizzle on top. I felt like this truly transformed these from granola to candy bar so you’ll have to choose your choice with that one. Preheat oven to 350ºF. Line square baking pan with parchment paper, leaving a small overhang on two sides. 8 X 8 would be ideal but whatever you have. In a large bowl, stir together oats, almonds, and coconut. Spread onto a baking sheet. Bake for 8 to 10 minutes, stirring once part way through baking. Combine honey, butter, and brown sugar in a small saucepan. Bring to a boil over medium heat, stirring occasionally, until butter is melted and sugar is dissolved. Remove from heat and stir in extract. Pour over oat mixture and stir until coated. 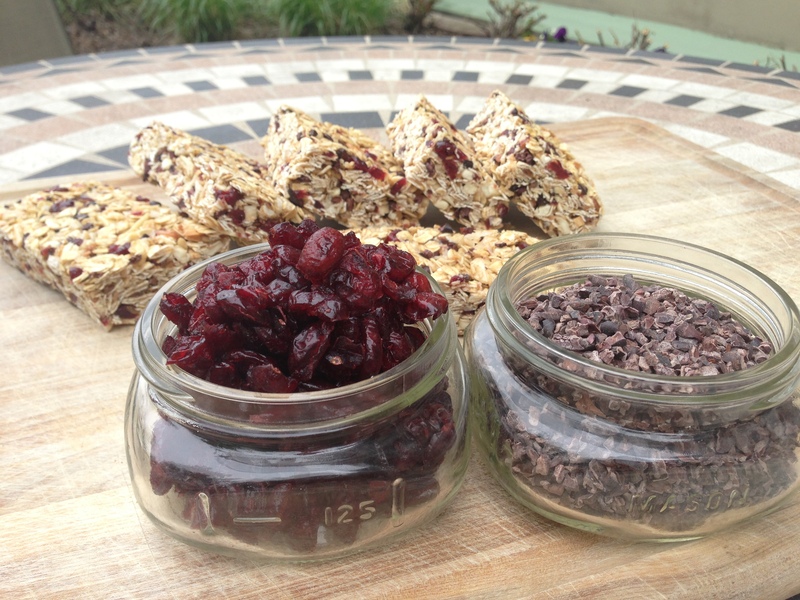 Stir in cocoa nibs and dried cranberries. Press granola mixture into prepared pan, firmly pressing into place. Chill until set, at least 2 hours. Remove from pan using parchment paper to lift it out of the pan. 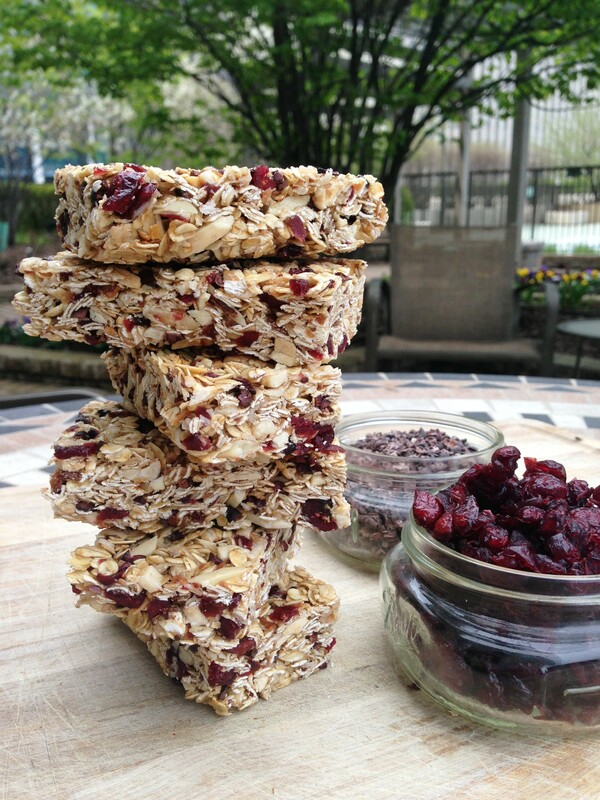 Transfer to a cutting board and cut into desired granola bar shapes. 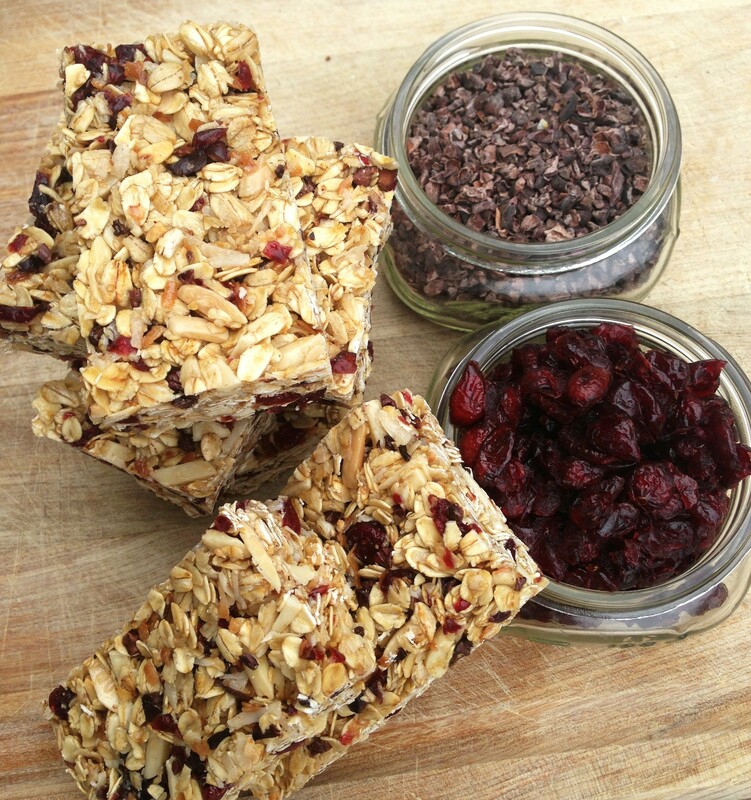 Granola bars will keep, layered between parchment or waxed paper in an airtight container for up to one week.